St Andrews Golf Breaks. Recognised the world over as the golfing mecca. Golf has been played on the Links at St Andrews since around 1400 AD and the Old Course is renowned throughout the world as the Home of Golf. The courses are public and there are six 18 hole courses to suit golfers of all abilities. Old Course - The oldest and most famous 18 holes in the world. The Old Course has played host to the greatest golfers that have ever lived. Please note that although tee-times on the Old course are limited, certain slots do become available. So, if you do want to play the Old Course, please be in touch. 18 holes. Par 72. 6,609 yds. Links. Fife Golf Breaks. New Course - The New Course opened in 1895 and is considered by many as one of the best courses on the links. 18 holes. Par 71. 6,604 yds. Links. 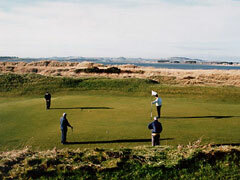 Jubilee Course - The Jubilee Course first opened in 1897 and is the most testing course on the links. 18 holes. Par 72. 6,742 yds. Links. Fife Golf Breaks. Eden Course - Opened for play in 1914, the Eden course was designed by the golf course architect, Harry S. Colt. His use of the natural features and of the partially buried field boundary walls gives the course an entirely natural feel. 18 holes. Par 70. 6,195 yds. Links. Strathtyrum - The Strathtyrum Course offers a shorter, less testing layout. 18 holes. Par 69. 5,094 yds. Links. Kingsbarns Golf Breaks, Kingsbarns Golf Links is links golf of the highest order, and this time the links are man-made! Californians Kyle Phillips and Mark Parsinen have painstakingly created a superlative route in which the sea is never out of sight and six holes actually skirt it. Kingsbarns, a triumph of ingenuity, artistry, and nature, is very probably the best course to open in Scotland since Turnberry was rebuilt after World War II. 18 holes. Par 72. 7,126 yds. Links. Fife Golf Breaks.